The German Nutrition Society (DGE), established in 1953, has since been engaged in topics on nutrition and nutritional research. From the onset, the DGE has been a non-profit organization committed to scientific facts. The DGE is an official incorporated society and is not influenced by economic or political interests. Currently there are about 4,000 DGE members. The annual general meeting of the members forms the main body of the DGE. This main body elects members of the scientific committee and administrative board every three years. The scientific committee consists of 34 scientists from nutrition science and related disciplines. The scientists work on a voluntarily basis. 11 members are elected every three years by the DGE members and 23 appointed by the members of the committee. 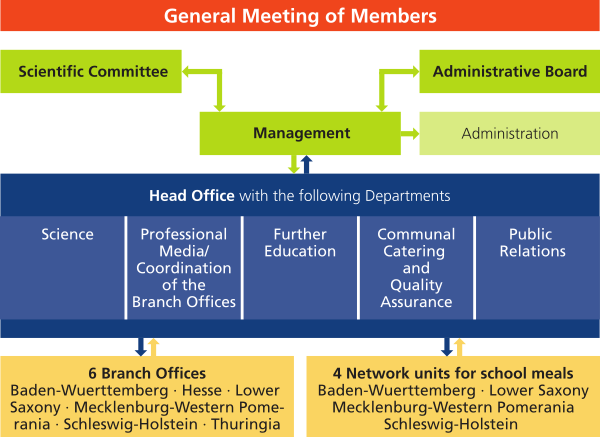 The administrative board is comprised of administration experts, members of the scienti- fic committee, the branch offices in the Federal States of Germany and the Federal Ministry of Food and Agriculture. The Board supervises the management of the DGE. The management is responsible for the implementation of activities, administrative tasks and personnel resources of the DGE. The DGE is regionally represented by branch offices in 6 Federal States: Baden-Wuerttemberg, Hesse, Lower Saxony, Mecklenburg-Western Pomerania, Schleswig-Holstein, Thuringia. The budget of the DGE averages at 6.75 million Euro per year. Approximately 25 % is covered by own revenue (e. g. sale of media, fees for educational courses and memberships) and 75 % by public funds. The DGE organizes congresses, symposia, workshops and seminars regularly, mainly for nutritional experts and journalists. There are various educational courses offered for professionals engaged in nutrition counselling and communal catering. The topics range, for example, from expert seminars on nutrition knowledge to seminars about counselling methods. The Nutrition Report provides the latest data on the nutritional situation and present nutritional problems in Germany. It is published every four years on behalf of the Federal Ministry of Food and Agriculture. The Reference Values for Nutrient Intake are the basis on which diets are planned to match nutritional requirements for food intake. In addition, they form the basis for food rules and regulations for the food industry and food monitoring. The majority of the revised reference values (e.g. energy) is published open access. The DGE publishes guidelines, in which the influence of nutritional factors (such as fat or carbohydrates) on the risk of diseases is analysed. These guidelines are based on a systematic literature research. The results of the literature search are critically reviewed and the strength of evidence is evaluated according to the judgement scheme of the World Health Organisation. At the end the practical consequences for current dietary recommendations are described. Food-based dietary guidelines are an important instrument to support a health-promoting diet. 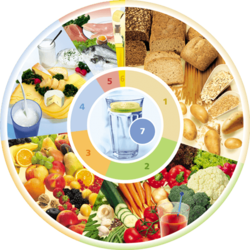 In Germany the official food-based dietary guidelines are developed by the DGE. For the first time they are summarized in one brochure. Based on background information about the development of dietary guidelines, the 10 guidelines of the DGE for a wholesome diet the DGE Nutrition Circle and the Three-Dimensional DGE Food Pyramid are elucidated. The brochure is intended for nutrition experts and multipliers and provides suggestions for using the DGE Nutrition Circle, the Three-Dimensional DGE Food Pyramid and the 10 guidelines of the DGE in one’s work. They summarise how a health-promoting sustainable diet can be implemented in everyday life and provide consumers with simple rules of conduct. All 10 guidelines do not imply strict commandments or prohibitions, but are recommendations leaving space for individual scope. For the compilation of the 10 guidelines, nutritional criteria as well as aspects of prevention, sustainability and enjoyment were taken into account. is a graphical model for the visualisation of qantitive dietary guidelines and is intended for healthy adults. Food selection according to the DGE Nutrition Circle is a reliable basis for the implementation of a wholesome diet. This food guide pyr1amid represents the German dietary guidelines. 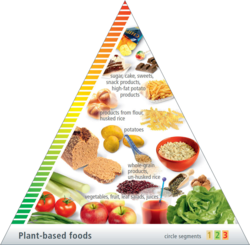 The Three-Dimensional Food Pyramid complements the DGE Nutrition Circle. The special feature of the Three-Dimensional DGE Food Pyramid is the combination of quantitative statements and qualitative statements in a single model. The DGE Nutrition Circle is the basis of the Three-Dimensional Food Pyramid. It is printed on the bottom surface of the pyramid and graphically illustrates the relative quantities of the different food groups which are required for a wholesome diet. The 4 lateral faces of the pyramid expand the quantitative recommendations on the bottom surface of the pyramid by recommendations regarding the choice within the food groups. The 7 food groups of the DGE Nutrition Circle are classified into 4 product groups: Plant based foods, animal-based foods, oil and fat, and drinks. The German Nutrition Society publishes the DGE-standards for nutritional education, to avoid confusion and to standardize statements in the field of nutrition. Ernährungs Umschau This scientific journal is the organ of the German Nutrition Society. Published monthly, it offers a source of various information and results derived from scientific studies for nutritional experts. Annals of Nutrition and Metabolism The monthly journal is the English-language organ of the DGE. All DGE members can read the online edition for free. Leaflets, booklets, books, electronic media for nutritional experts and consumers are available. The science based newsletter “DGEinfo” informs those active in nutrition counselling. The press releases “DGE aktuell”, “DGE intern" and "aus der Wissenschaft” offer well-founded news and background information to journalists.